Did I mention we have a new series? Export beers. That's it. Today's recipe is the first in the series. And from whom else could it be but Barclay Perkins? This beer is a particularly good example of a phenomenon. What happened to export versions after WW I. 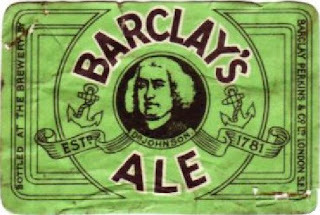 Here's a funny thing: before WW I, the export version of Barclay Perkins Pale Ale was lower in gravity than the domestic version. 1058º to 1060.4º. 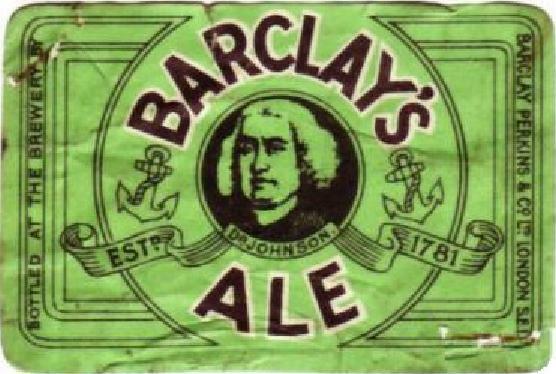 In 1917, Barclay Perkins stopped brewing any kind of Pale Ale. Not that they'd ever brewed that much of it. Most batches were only 60 or 70 barrels, compared to 300 or 400 for XLK (ordinary Bitter) and 1,000 plus for X Ale. When PA reappeared in the early 1920's, it was initially close in srtrength to the pre-war version: both export and domestic were around 1059º. But after a couple of years the domestic PA dropped to 1053º, where it stayed until the outbreak of WW II. The phenomenon I mentioned? Post-WW I export beers resembling pre-WW I domestic beers. And export versions changing from being weaker than their domestic counterpart to being stronger. In 1924, the difference between export and non-export PA was minimal. Just the sugar, really. Export used No.1 invert, domestic No.3. I've not much to say this week, so over to Kristen . . . . Grist – The most important thing in this recipe is getting the best quality pale malts. Choose your favorites, you’ll like the outcome better. I really like the combination of Optic malt and Maris Otter which I used for this one. The rich maltiness goes very well with the grainy husky character of the 6-row. For the invert, I’ve used no1, Golden syrup and plain old white sugar. I didn’t really see much of a difference with the No1 and sugar but the Golden Syrup added a nice little caramel note the others didn’t. Pick your poison. Hops – Whether you use the Bramblings or not for the bittering addition I’ve found that Challenger, Nugget, etc work about the same. I couldn’t tell the difference with any of them. The Cluster added a unique catty quality to the beer but is was very mild. The harsher resins from the Cluster really brightened the middle. I just got some very very fresh Willamettes that I used for the dry hopping that worked beautifully, not to mention I didn’t know I was out of Goldings. Yeast – (repeat of previous) I chose my favorite PA yeast here. The Tim Taylor strain. However, I really love the Whiteshield nearly as much but its also drops a ton of that minerally character. If you have hard water, use the Taylor, if you have soft use the Whiteshield. Salts – Lots of salt tweaking here. They are using Gypsum and Epsom at 1g/L and 0.2g/L. I’ve tried making this with both. I prefer the one with salt over non-salt BUT its my preference. If you like more mineral laden beers, do it up. If not, don’t. A little addendum to this. I added my salts in the mash and boil for different batches. I found that I get a similar results for both. For easy of use, I'd start with added the salts to the boil. At the beginning. Have you ever tried adding salts post boil? We were thinking of doing a split batch with salts vs no salts. It would be easiest if salts could be added post boil after the wort was split.